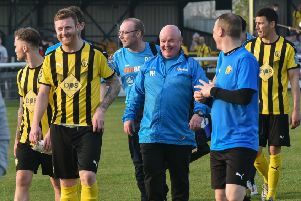 The subtle differences between a side on a ten-match winning run and one battling against relegation were emphasised last Saturday as Leamington tumbled to a heartbreaking home defeat, writes Paul Okey. With five minutes remaining, Brakes could feel aggrieved to only be in possession of a point against their in-form visitors. However, a couple of defensive mistakes were ruthlessly pounced on by Brendan Daniels, who shot home from a narrow angle to leave the hosts with nothing to show from one of their most enterprising performances of the season. Lee Moore set the tone in the first minute with a positive run to the byeline but there was no one in the box to convert his tantalising centre. As Brakes pressed, a header from Dominic Langdon, who has moved to the New Windmill on a short-term deal from Solihull Moors, was headed off the line, with a stray leg deflecting James Mace’s follow-up for a corner. Javan Vidal then produced a stunning clearing header from under the bar to keep out Mace’s sweetly hit volley from the resultant dead ball. Stung by the ferocity of Brakes’ opening, the Lambs slowly worked their way into the game and should have taken the lead in the tenth minute after Ross Atkins’ superb point-blank save from Paul Green fell to the feet of Josh Sampson eight yards out. However, the defender could only screw his shot tamely wide. Dave Hibbert got a shot away after getting the better of Langdon but Atkins was equal to it, allowing Langdon to tidy up. In contrast to their hosts, Tamworth gained reward for their spell of pressure, with Connor Taylor credited with the opening goal after Atkins failed to deal with Daniels’ cross from the left. However, Jordan Goddard appeared to get the final touch, inadvertently diverting the ball past Atkins after the keeper palmed out the initial delivery. Brakes were behind for just four minutes, Delroy Gordon rising highest to power Goddard’s corner inside the near post and could count themselves unfortunate not to be leading at the break. Danny Newton was wayward with a shot from outside the box, but his persistence was almost rewarded in the 38th minute when he chased down a hopeful ball into the box from Lee Moore and got a telling touch to draw a fine one-handed save from James Belshaw. Dan Preston’s heart was in his mouth as he glanced a Morley free-kick inches wide of his own post. Tamworth broke quickly from the corner and Jon Adams’ cross-shot was fumbled by Atkins before play quickly switched to the other end, with Lee Chilton inches away from converting Moore’s cross. As half-time approached it was still the home side who looked the more likely, with Morley testing Belshaw with a long-range free-kick and Goddard conjuring up a shot from nothing which was also dealt with by the Lambs keeper. After a breathless first half, the pace understandably dropped after the interval, but it was still the home side who were asking most of the questions. Goddard almost put Brakes ahead with his block from a Tamworth clearance squirming past the post from close range. Moore was agonisingly close to getting the final touch to Chilton’s scuffed cross-shot, while Belshaw had to be alert to gather Newton’s dangerous centre. Atkins had a rare moment of anxiety when Gordon got a big deflection on a shot, gathering under his bar at the second attempt and Andy Morrell had seen enough, introducing Dominic Smith and Reece Styche to try and pep up his misfiring side. Still, Leamington pushed for a second, with Newton getting a little too much purchase on his lob, with Belshaw looking exposed. Brakes then produced their best move of the match, with neat interplay in midfield working the ball to Goddard on the edge of the box. The midfielder then wriggled between two defenders and poked his shot just over the bar. It was to prove Goddard’s final contribution with the midfielder, who had been suffering with illness in the build-up to the game, withdrawn in favour of the returning Nathan Hicks. Morley’s fierce shot from outside the box grazed the crossbar, while at the other end the Brakes captain was close to giving away an own goal after skewing a clearance . A vicious dipping shot from Daniels drew a sprawling save from Atkins and he went close again with a header from a free-kick. His next involvement, however, was much more clinical. There seemed little danger with Langdon in possession along the backline, but the centre-back overhit his back-pass to Atkins whose heavy first touch allowed Daniels to rob him on the edge of the box. The angle still looked to be beyond the Lambs man, but he rolled his shot past the despairing dive of Atkins and just inside the far post to spark jubilant scenes among the travelling support. With the wind duly sucked from their sails, Brakes struggled for a response, with a bout of pinball in the Tamworth boxand a Hicks lob all they could muster in the closing stages. That their luck was out on both occasions will come as no surprise to those familiar with the fortunes of struggling sides. brakes: Ross Atkins, James Mace, Stephan Morley, Joe Magunda, Delroy Gordon, Dominic Langdon, Jordan Goddard (Nathan Hicks, 73), James Fry, Lee Chilton (Matt Dodd, 88), Lee Moore, Danny Newton. Subs not used: Jack Edwards, Aron Wint, Simon Forsdick. Tamworth: James Belshaw, Javan Vidal, Josh Sampson, Tom James, Dan Preston (Dominic Smith, 67), Jon Adams, Paul Green (Reece Styche, 62), Shane Clarke, Dave Hibbert, Connor Taylor (Kevin Thornton, 84), Brendan Daniels. Subs not used: Phil Trainer, Sean Wilkins.